Maximum Input for ADF (Width/Height) 11"/17"
Minimum Input for ADF (Width/Height) 4.1"/5.8"
Sheet Weight - ADF (Min/Max) 17-24 lbs. Borderless Printing‡ Borderless printing is available for Letter, Ledger, 3.5"x5", 4"x6", 5"x8", 5"x7", A3, A4, and A6, paper sizes. Carton Contents‡ Actual yield of initial cartridges will be approx. 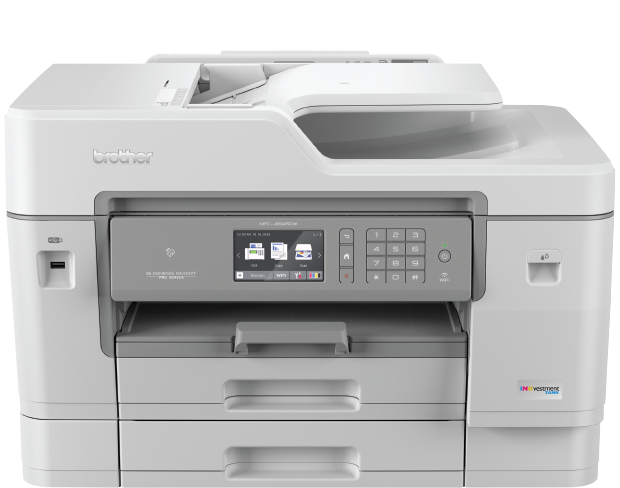 100% of replacement LC3037 Series, , due to ink system initialization. All replacement cartridges will provide approximate page yield stated in accordance with ISO/IEC 24711. For more page yield information, see www.brother.com/pageyield. Cost Per Page‡ Based on MSRP of LC3039 black and color ink cartridges and approximate page yield in accordance with ISO/IEC 24711. For more page yield information, see www.brother.com/pageyield. Page Gauge‡ Page Gauge is an estimate for informational purposes only. For actual cartridge yield information refer to www.brother.com/pageyield. PC Fax Capability‡ Black & White only. Up to 1 Year of Ink In-box‡ Based on average monthly print volumes of approximately 300 pages at 60% black pages / 40% color pages in accordance with ISO/IEC 24711 using 4 cartridges provided in-box. For more page yield information, see www.brother.com/pageyield. 1 For WIA, 1200x1200 resolution. 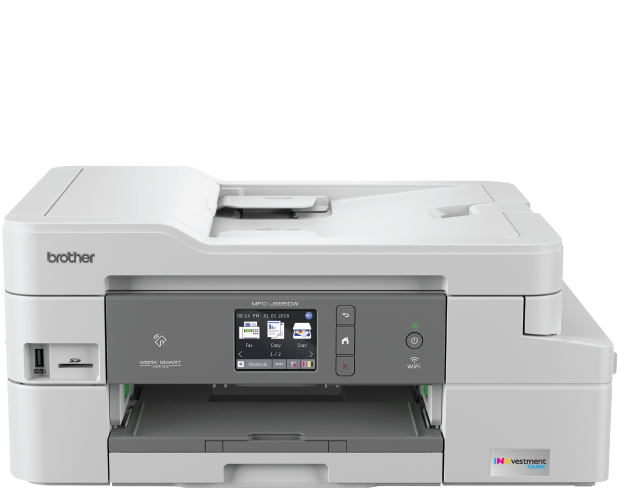 Brother Scanner Utility enables to enhance up to 19200 x 19200 dpi. 2 Third party USB ports are not supported. 3 PC Fax supports black and white only. 4 PaperPort™ 14 supports Windows 7, Windows 8, Windows 8.1 and Windows 10 Home, 10 Pro, 10 Education and 10 Enterprise. 5 Removable disk and Network Media Access are functions of PhotoCapture Center®. All trademarks, brand and product names are property of their respective companies. 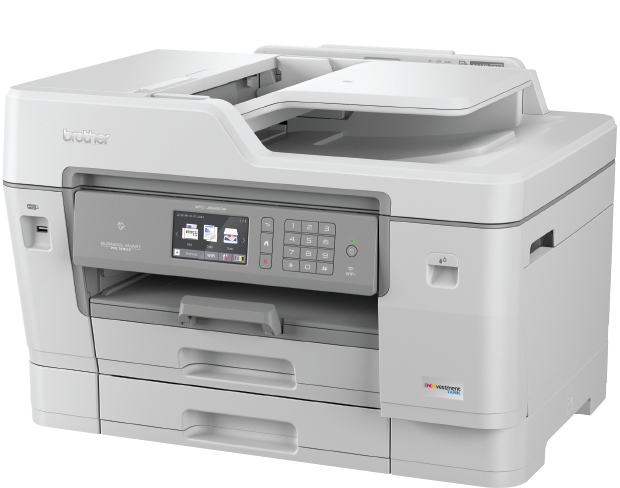 The MFC-J5845DW includes mobile device printing,7 flexible paper handling, 11" x 17" printing, automatic two-sided printing and a 3.7" color touchscreen for easy onscreen navigation. 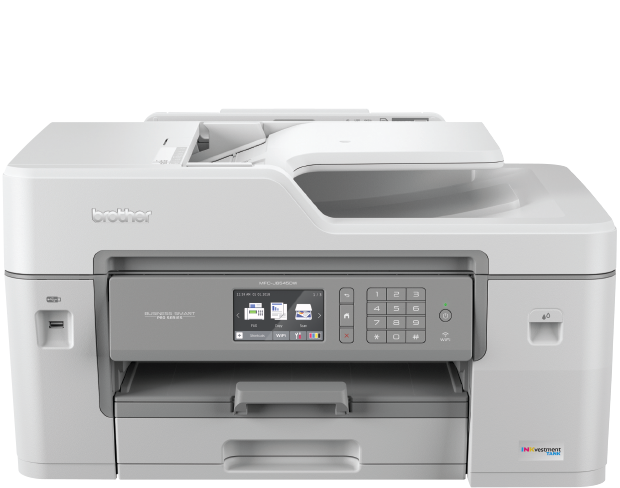 The MFC-J5945DW features include mobile device printing,7 NFC,8 11" x 17" printing, 500-sheet capacity paper tray, single-pass duplex copying and scanning and a 3.7" color touchscreen for easy onscreen navigation. 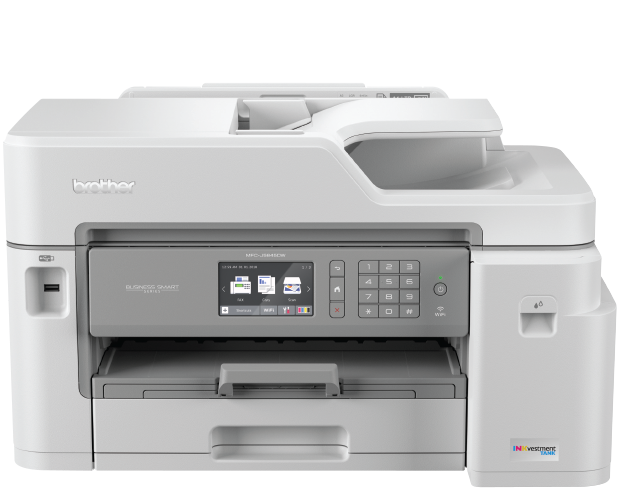 BUSINESS SMART – PRINT, COPY, SCAN, FAX UP TO 11" X 17"
The MFC-J6545DW offers print, copy, scan and fax up to 11" x 17" and up to 1-year of printing.1 Includes mobile device printing,7 11" x 17" scan glass, automatic two-sided printing and a 3.7" touchscreen. 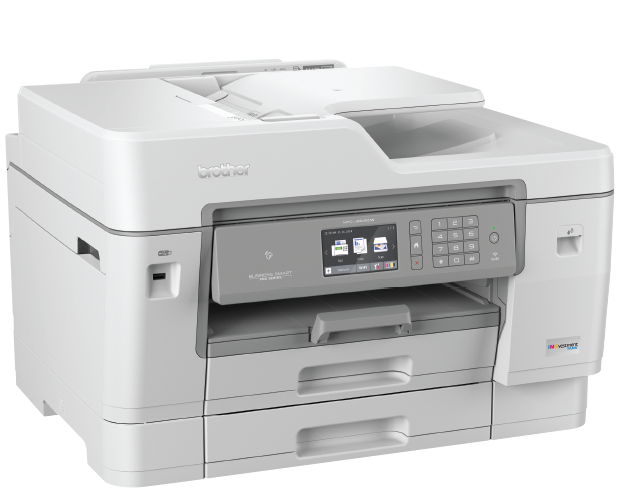 The MFC-J995DW delivers uninterrupted printing for up to 1-year1 without the need to purchase ink. 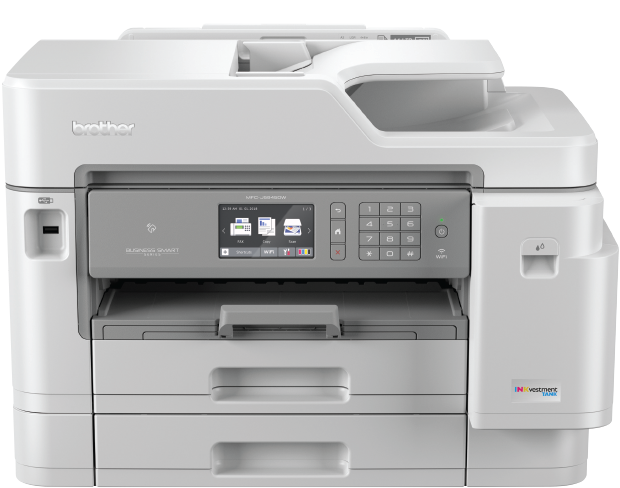 Business-capable features include mobile device printing,7 flexible paper handling options, and automatic two-sided printing.